Easter jokes for kids will help your children get into the spirit of Easter. Need some new kids' Easter jokes to add to your collection? We've got some funny ones that your kids will love! The following Easter jokes for kids may be very silly and even corny, but they're sure to bring a smile to everyone's face! Q: What would you get if you crossed the Easter Bunny with a stressed person? Q: What do you call ten rabbits marching backward? Q: What do you call a dumb bunny? A: Just look for the grey hares! A: He didn't have the hare fare! Q: What do you call a rabbit who performs stand up comedy? A: To the re-tail store! Q: How do you know when you're eating rabbit stew? A: When it has hares in it! Q: How does an Easter chicken bake a cake? A: Because they've just finished a March! Q: What do you get when you cross a bumblebee with the Easter bunny? Q: What's the Easter Bunny's favorite mode of transportation? Q: What kind of stories are the Easter Bunny's favorite? Jokes are just silly tidbits of nothing really important, right? After all, why should kids, or adults, even bother with Easter jokes and riddles? The short answer? They're funny, and people love to laugh! There is more to it than that, however. Mood boosters-If you and your kids are having a rather dreary or depressing day, gather together some jokes and take turns reading them out loud. Jokes can brighten your day, and a lot of the humor comes from watching your little ones try to tell the jokes correctly! Holiday celebrations-Your kids love participating in activities that celebrate special holidays and events. Create a collection of jokes that ring in the special day with laughter. Telling or creating Christmas, Valentine's, or Easter jokes for kids is a wonderful way to commemorate a fun holiday! Language development-As your children tell jokes to you, other family members, and friends, they won't even realize that they're improving their language and speech skills. Simply reciting something aloud is wonderful speech practice, as kids work on their tone, confidence, and pronunciation. Riddles and tongue twisters are particularly good for this sort of practice! Creativity-Have you ever watched a child attempt to make up her own joke? While the joke she tells may be corny and even confusing, the joy that is registered on her face will certainly make up for any mistakes she made. What can you do with the jokes you collect? Separate the questions from the answers, and have kids try to match them correctly. Place them inside plastic eggs, and let children read them to each other after an Easter egg hunt. Make a collage of jokes on poster board. Kids can use markers and crayons to draw Easter symbols around the edges of the collage. Decorate and then frame a piece of construction paper filled with jokes. Easter jokes will keep your whole family laughing during this holiday and throughout the year! 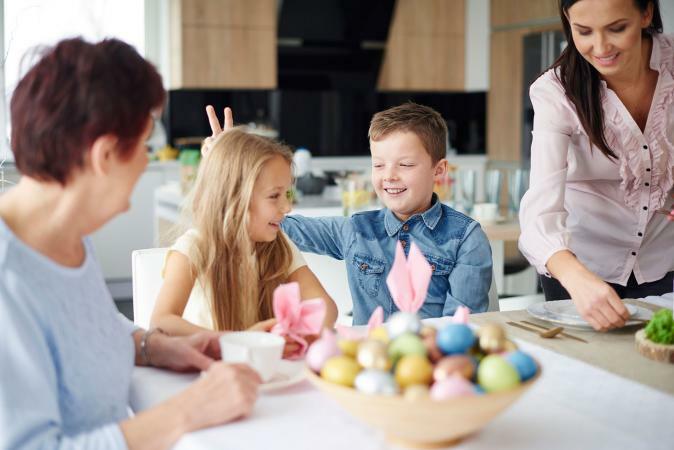 Whether you're laughing about funny Easter bunny jokes for kids or other Easter-themed jokes, have fun and enjoy all the giggles to come.